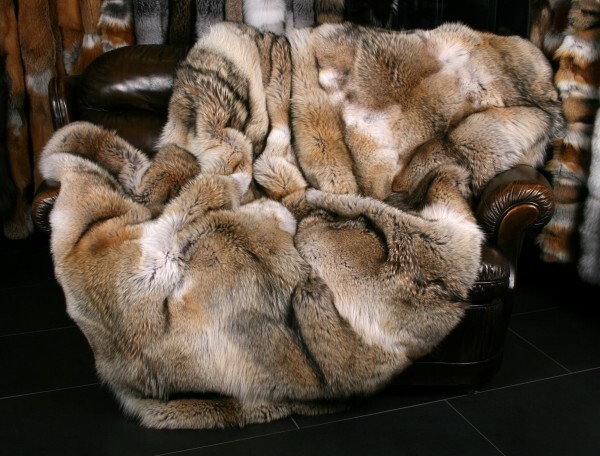 Rustic style coyote fur blanket made from high-grade Canadian coyote skins. The fur blanket is not only perfectly manufactured to your likings but also made from coyote pelts bought from "Fur Harvesters" in Canada. We used a matching wool lining and a German soft wadding inlay from 100% real wool to get a luxury product. Our coyote fur blanket is a perfect accessory for your home design. The Canadian coyote lives in the Canadian wilderness, and the population is controlled because of the risk of overpopulation. Convince yourself of the incredible quality and care we put into crafting this high-quality fur blanket. We would gladly create this blanket in any custom size you would like. Related links to "Coyote Fur Blanket - Fur Harvesters Quality"
Customer reviews for "Coyote Fur Blanket - Fur Harvesters Quality"